This blog will cover two variations of the squat jumps exercise. 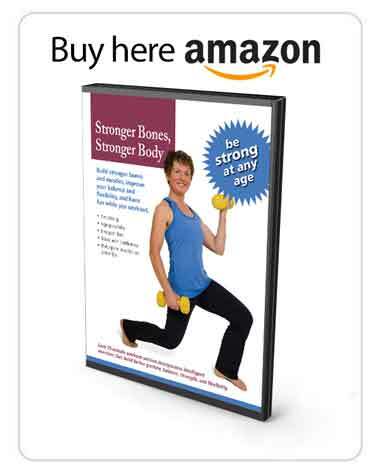 Strengthen and build bones (specifically of the spine). 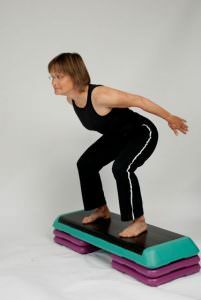 Strengthen the muscles throughout the body that provide stability and improve balance. However, a word of caution for some individuals: due to the increased compression forces when landing while doing the squat jumps, this exercise should not be done by individuals who are at high risk of bone fracture. Please use your discretion. What Muscles do the Jump Squats Work? The Double Leg Squat Jumps is an Athletic level strength exercise from the Exercise for Better Bones Program. The exercise is designed to target muscles in the calves, quadriceps, and buttocks. It also targets bones in the spine and hips. In this video I demonstrate the exercise and the in the video below that I provide some tips for health professionals. The following are the instructions for the double leg squat jumps exercise. I recommend that you start with a small step, where you just do one riser to begin. You gradually build up your riser height. Jumping has been shown to be very effective in bone building, but your form in landing is very important. You want to ensure that you start with a nice wide stance, at least hip-width apart. You bring your arms behind you at the beginning of your jump. Okay. So breath in, arms behind you. And when you land your jump, you want to ensure that your knees are lining up over your second toe. Knee in the same line, just as we talked about with the squats. And that’s it for the double leg squat jumps exercise. The following are the professional tips for the double leg squat jumps exercise. For many of you, this is probably the first time that you’re either watching your clients jump or evaluating their quality of jumping from different heights. Always start with low-jump heights and gradually build them up. This is especially important for your athletes who have jumping sports. Start then in the most functional position. If they are basketball players, they’ll be jumping from a variety of stances, and so you want to ensure that you evaluate all those stances. Initially, the hip-width is usually the easiest, arms behind, and as they land their jump, it’s really critical that they track with the mid over the second toe. And then, oftentimes, they don’t have an awareness, and so, working in front of a mirror is really critical and helps them. And then, even pairing up teammates with their drills helps them a lot to reinforce the jumping form. So, that’s it for the professional tip. The Squat Jumps is a strength exercise from the Exercise for Better Bones program specifically designed for the Elite Level. The exercise targets the muscles of the calves, quadriceps, buttocks and hips. It also targets the bones in the spine. The following are the instructions for the squat jumps exercise. When you have made progress with your squats and want to do a squat that is more advanced and demanding on your bones and muscles, consider the jump squats. Jump squats are a dynamic, plyometric, and explosive move. You want to ensure that your form is really good and that you are ready for this exercise. Please have someone watch you if you’re not 100% sure because it’s actually hard to see yourself when you’re moving so fast. With the squat jump, you come down into a squat position, arms come behind you, you’re flexing at the knees and hips and ankles. You’re going to explode up and back into the squat position. I’m going to do a couple for you to see. I have a hyperwear vest that I stopped using because my dexa scans didn’t improve. How do I start and progress with this. I know to start at the upper back. Have been doing your exercises for a few months and the yoga exercises recommended. Thanks for all your help. Have several books too. Will add jumps today. 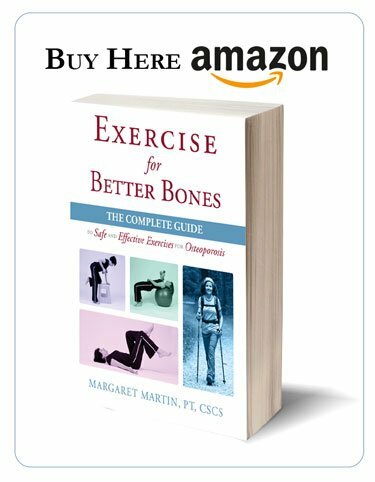 Remember that when it comes to exercises and bones it can be a little frustrating. 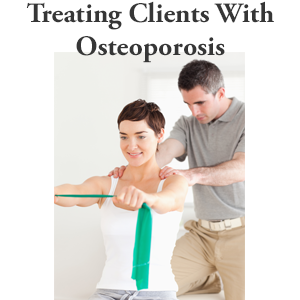 Bone density os only one aspect of reducing your fracture risk. Bone quality is as if not more important! 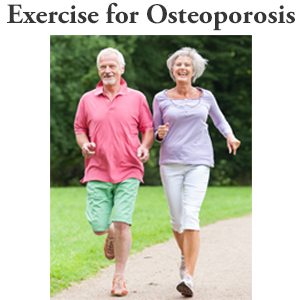 Studies have shown individuals with fractures but having only slightly osteopenic scores while those with osteoporotic scores not fracturing. The difference lies in the bone quality! Exercise plays a bigger role in the quality of your bones than the density. For more tips you can go to the link below. It is a lengthy blog and so you might want to go to section 4 that will address your question. Everyday makes a difference. Just take it one day at a time.